California's forests are home to the planet's oldest, tallest and most-massive trees. New research from Carnegie's Greg Asner and his team reveals that up to 58 million large trees in California experienced severe canopy water loss between 2011 and today due to the state's historic drought. Their results are published in Proceedings of the National Academy of Sciences. In addition to the persistently low rainfall, high temperatures and outbreaks of the destructive bark beetle increased forest mortality risk. But gaining a large-scale understanding a forest's responses to the drought, as well as to ongoing changes in climate, required more than just a picture of trees that have already died. 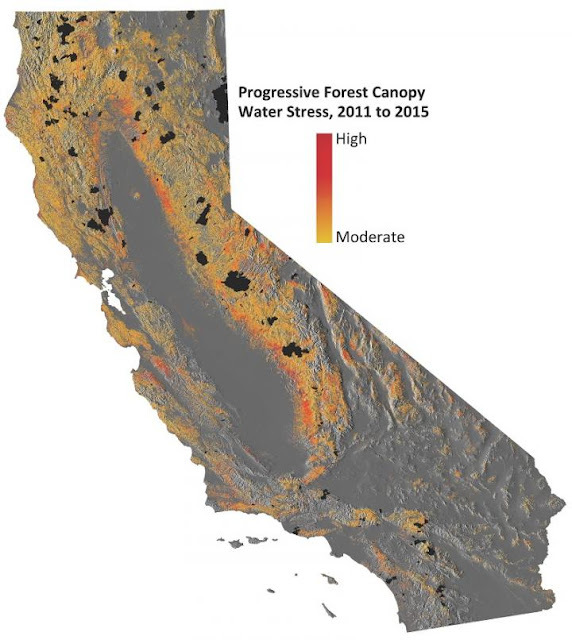 This image shows progressive water stress on California's forests. 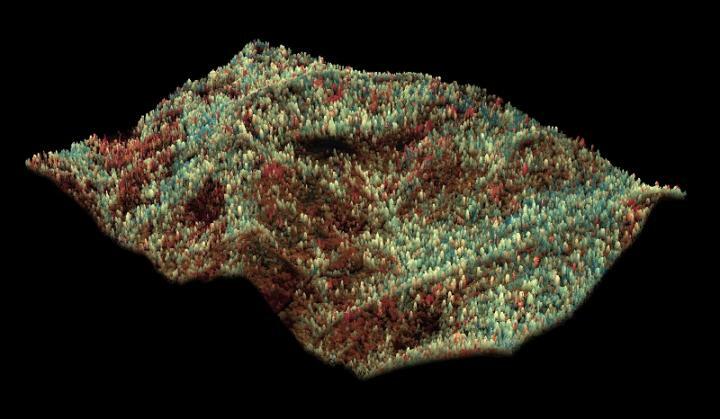 A higher-tech approach was necessary; so Asner and his team used the laser-guided imaging spectroscopy tools mounted on the Carnegie Airborne Observatory (CAO) to measure the full impact of the drought on California's forests for the first time. They combined the CAO data with more-traditional satellite data going back to 2011. Their new approach revealed a progressive loss of water in California's forest canopies over the four-year span. Mapping changes in canopy water content tells scientists when trees are under drought stress and greatly aids in predicting which trees are at greatest death and fire risk. "California relies on its forests for water provisioning and carbon storage, as well as timber products, tourism, and recreation, so they are tremendously important ecologically, economically, and culturally," Asner explained. "The drought put the forests in tremendous peril, a situation that may cause long-term changes in ecosystems that could impact animal habitats and biodiversity." The team's advanced tools showed that about 41,000 square miles (10.6 million hectares) of forest containing up to 888 million large trees experienced measurable losses of canopy water between 2011 and 2015. Of this group, up to 58 million large trees reached water loss thresholds that the scientists deemed extremely threatening to long-term forest health. Given the severity of the situation, even with increased precipitation due to El Nino, if drought conditions reoccur in the near future, the team predicts that there would be substantial changes to already significantly weakened forest structures and systems. This image shows mixed levels of drought stress in a forested landscape in California. "The Carnegie Airborne Observatory's research provides invaluable insight into the severity of drought impacts in California's iconic forests. It will be important to bring their cutting-edge data and expertise to bear as the state seeks to address the effects of this epidemic of dying trees and aid in the recovery of our forests," said Ashley Conrad-Saydah, deputy secretary for climate policy at the California Environmental Protection Agency. Since day one of CAO flight operations, Asner has been engaged with forest managers and officials from the California EPA and Department of Forestry and Fire Protection to inform decision-makers on the severity of forest water losses from the drought and beetle outbreaks. The team's results also helped motivate the California governor's recent proclamation of a state of emergency for dead and dying trees across the state. The latest CAO maps of forest vulnerability were recently transmitted to both state and federal partners. "Our high-resolution mapping approach identifies vulnerable trees and changing landscapes," Asner added. "Continued airborne and satellite monitoring will enable actions on the ground to mitigate a cascade of negative impacts from forest losses due to drought, as well as aid in monitoring forest recovery if and when the drought subsides." 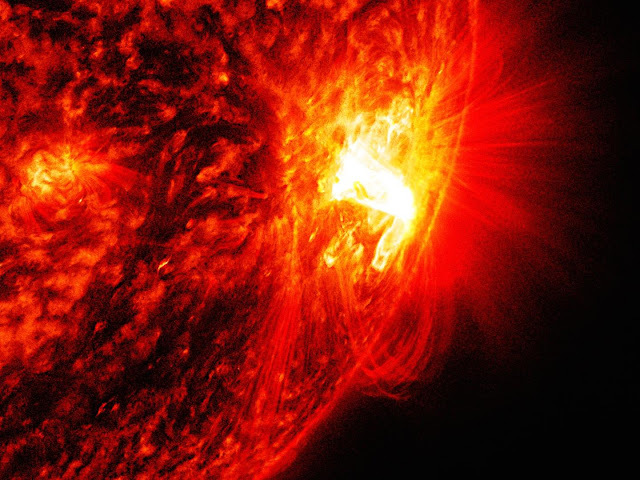 Among the most feared events in space physics are solar eruptions, massive explosions that hurl millions of tons of plasma gas and radiation into space. These outbursts can be deadly: if the first moon-landing mission had encountered one, the intense radiation could have been fatal to the astronauts. And when eruptions reach the magnetic field that surrounds the Earth, the contact can create geomagnetic storms that disrupt cell phone service, damage satellites and knock out power grids. NASA is eager to know when an eruption is coming and when what looks like the start of an outburst is just a false alarm. Knowing the difference could affect the timing of future space missions such as journeys to Mars, and show when steps to protect satellites, power systems and other equipment need to be taken. This solar flare occurred at the peak of the solar cycle in October 2014 with no observed eruptions. PPPL researchers say this is a promising candidate for studying the effect of guide magnetic fields. At the U.S. Department of Energy's Princeton Plasma Physics Laboratory (PPPL), researchers led by physicist Clayton Myers have identified a mechanism that may halt eruptions before they leave the sun. The finding, reported in the December 24-31 issue of Nature magazine, provides a potentially important way to distinguish the start of explosions from buildups that will fail. This work was supported by the DOE office of Science. The violent eruptions, called "coronal mass ejections," stem from a sudden release of magnetic energy that is stored in the sun's corona, the outermost layer of the star. This energy is often found in what are called "magnetic flux ropes," massive arched structures that can twist and turn like earthly twine. When these long-lived structures twist and destabilize, they can either erupt out into the solar system or fail and collapse back toward the sun. The researchers found in laboratory experiments that such failures occur when the guide magnetic field -- a force that runs along the flux rope -- is strong enough to keep the rope from twisting and destabilizing. Under these conditions, the guide field interacts with electric currents in the flux rope to produce a dynamic force that halts the eruptions. PPPL has discovered the importance of this force, called the "toroidal field tension force," which is missing from existing models of solar eruptions. The researchers discovered this importance using the Laboratory's Magnetic Reconnection Experiment (MRX), the world's leading device for studying how magnetic fields in plasma converge and violently snap apart. The scientists modified the device to produce both a flux rope, which stores a significant amount of energy that seeks to drive the rope outward, and a "potential magnetic field" like the ones that enclose the rope in the solar corona. This potential magnetic field is composed of magnetic "strapping" and "guide" fields, each of which provides restraining forces. Eruptions burst forth when the restraining forces in the strapping field become too weak to hold the rope down, creating what is called a "torus instability" that shoots plasma into space. The guide field, which reduces the twist in the flux rope, had long been thought to be of secondary importance. But the researchers found that the guide field can play an important role in halting eruptions. When the flux rope starts to move outward in the presence of a sufficiently powerful guide field, the plasma undergoes an internal reconfiguration -- or "self-organization" -- that causes the eruption to lose energy and collapse. "The presence of a substantial guide field should therefore indicate a reduced probability of eruption," said Myers. Solar physicists should thus be on the lookout for guide fields, which can be found in relatively simple reconstructions of the sun's potential magnetic field. One promising candidate for study is the largest active region in the peak solar cycle that took place in October 2014, which produced many large flares but no observed eruptions. Preliminary analysis of this region shows that a number of these flares were associated with failed eruptions that could have been caused by the mechanism the MRX experiments found. Sb atoms and Te atoms serve as the glue to fix the N-S orientations of Cr atoms in Cr-doped (Sb, Bi)2Te3. 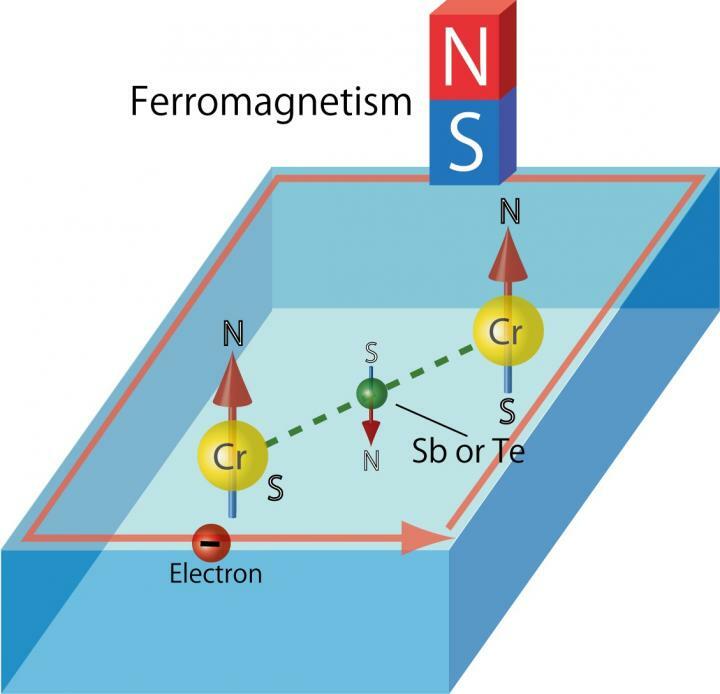 This makes the material ferromagnetic. Scientists say 'forbidden' substances may increase heat transfer rates and strengthen magnetic fields on super-Earths. A more powerful magnetic field means more powerful protection from cosmic radiation, and consequently more favourable conditions for living organisms. The researchers also predicted new magnesium and silicon oxides that do not fit in with the rules of classical chemistry -- SiO, SiO3, and MgO3, in addition to the oxides MgO2 and Mg3O2 previously predicted by Oganov at lower pressures. The computer model also enabled the researchers to determine the decomposition reactions that MgSiO3 undergoes at the ultra-high pressures on super-Earths -- post-perovskite. "This affects the boundaries of the layers in the mantle and their dynamics. For example, an exothermic phase change speeds up the convection of the mantle and the heat transfer within the planet, and an endothermic phase change slows them down. This means that the speed of motion of lithospheric plates on the planet may be higher," says Oganov. The fact that the Earth's continents are in constant motion, "floating" on the surface of the mantle, is what gives volcanism and a breathable atmosphere. If continental drift were to stop, it could have disastrous consequences for the climate. Pioneering new research has shed new light on the causes behind an ‘ice-age’ that took place on Earth around 170 million years ago. An international team of experts, including researchers from the Camborne School of Mines, have found evidence of a large and abrupt cooling of the Earth’s temperature during the Jurassic Period, which lasted millions of years. Four fairly regular glacial-interglacial cycles occurred during the past 450,000 years. The shorter interglacial cycles (10,000 to 30,000 years) were about as warm as present and alternated with much longer (70,000 to 90,000 years) glacial cycles substantially colder than present. Notice the longer time with jagged cooling events dropping into the colder glacials followed by the faster abrupt temperature swings to the warmer interglacials. This graph combines several ice-core records from Antarctica and is modified from several sources including Evidence for Warmer Interglacials in East Antarctic Ice Cores, 2009, L.C. Sime and others. Note the shorter time scale of 450,000 years compared to the previous figure, as well as the colder temperatures, which are latitude-specific (e.g., Antartica, Alaska, Greenland) temperature changes inferred from the Antarctic ice cores (and not global averages). The scientists found that the cooling coincided with a large-scale volcanic event – called the North Sea Dome – which restricted the flow of ocean water and the associated heat that it carried from the equator towards the North Pole region. The team suggest that it is this volcanic event, preventing the ocean flow, rather than a change in CO2 in the atmosphere (which causes today’s climate change), that led to an extended Ice age in a period more synonymous with very warm conditions. The research appears in respected scientific journal, Nature Communications, on Friday, December 11 2015. Geology experts Professor Stephen Hesselbo and Dr Clemens Ullmann, both from the Camborne School of Mines, based at Exeter’s Penryn Campus in Cornwall, took part in the study. Rather than the seven continents that cover Earth’s surface today, during the Jurassic Period there was one single ‘supercontinent’, called Pangaea. This supercontinent had a broad seaway across it that connected a north polar sea to a warm equatorial ocean, called Tethys. The team of scientists spent 10 years constructing a record of seawater temperature change using fossil mollusc shells. They found that during the same period that the North Sea Dome event occurred, the Earth experienced a significant and fast cooling in temperature. The team have hypothesized that this volcanic event restricted the poleward flow of ocean water and associated heat, flipping the northern hemisphere from a very warm climate to a cold climate state. The evidence indicates that this cold period lasted many millions of years, until the North Sea Dome subsided. The research, called "Jurassic climate mode governed by ocean gateway” is published online by Nature Communications. 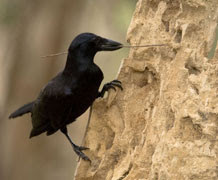 Scientists have been given an extraordinary glimpse into how wild New Caledonian crows make and use ‘hooked stick tools’ to hunt for insect prey. The pair developed tiny video ‘spy-cameras’ which were attached to the crows, to observe their natural foraging behaviour. The findings are reported in the Royal Society’s journal Biology Letters on Wednesday, December 23. Dr Troscianko is a Postdoctoral Research Fellow in Exeter’s Biosciences Department based at the Penryn Campus in Cornwall, who worked on the project while at the University of Birmingham. 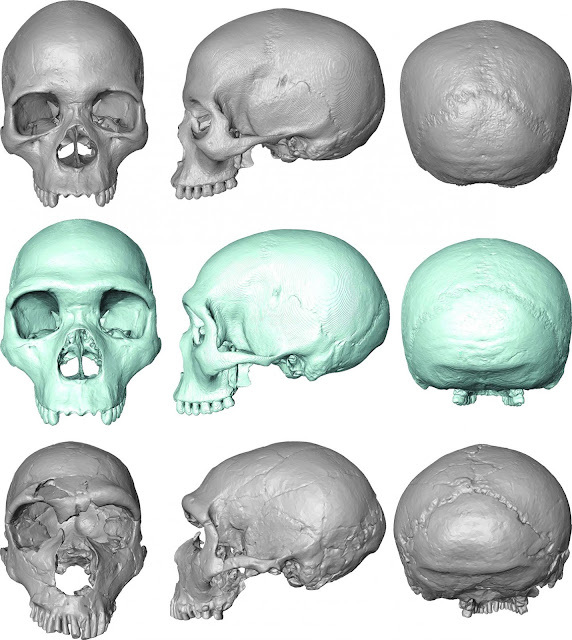 This is the 'virtual fossil' of last common ancestor of humans and Neanderthals as hypothesized in the new study. New digital techniques have allowed researchers to predict structural evolution of the skull in the lineage of Homo sapiens and Neanderthals, in an effort to fill in blanks in the fossil record, and provide the first 3D rendering of their last common ancestor. Here, lead researcher Dr. Aurélien Mounier from Cambridge's Leverhulme Centre for Human Evolutionary Studies describes part of the research that led to this 'virtual fossil'. Top: Modern human skull from 19th century South Africa. Now part of the Duckworth Collection at the Leverhulme Centre for Human Evolutionary Studies, University of Cambridge. Middle: 'Virtual fossil' of Last Common Ancestor Bottom: Neanderthal skull found in La Ferrassie, France, and dating from 53 to 66 thousand years ago. Now curated in the Musée de l'Homme in Paris. "We wanted to try an innovative solution to deal with the imperfections of the fossil record: a combination of 3D digital methods and statistical estimation techniques. This allowed us to predict mathematically and then recreate virtually skull fossils of the last common ancestor of modern humans and Neanderthals, using a simple and consensual 'tree of life' for the genusHomo," he said. 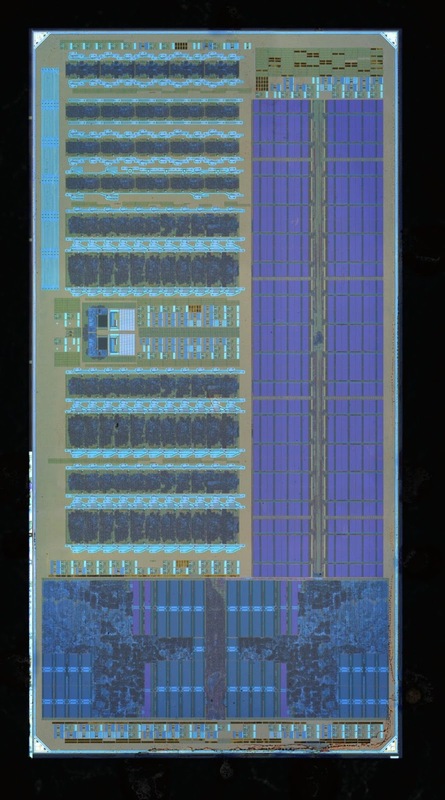 This packaged electronic-photonic processor microchip under illumination reveals the chip's primary features. The light rays emanating from the chip are drawn to show that the processor talks to the outside world using light. This is a raw, high-resolution photo of the chip, with all chip electrical and photonic features clearly visible. Photo taken under microscope at the UC Berkeley Marvell Nanofabrication Laboratory. 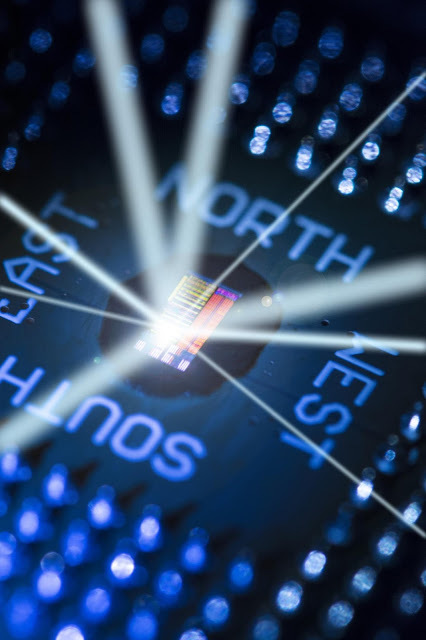 The electronic-photonic processor chip communicates to the outside world directly using light. 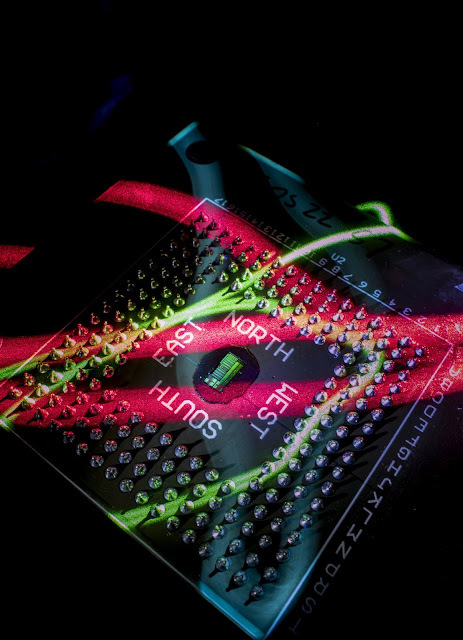 This photo shows the chip naturally illuminated by red and green bands of light. 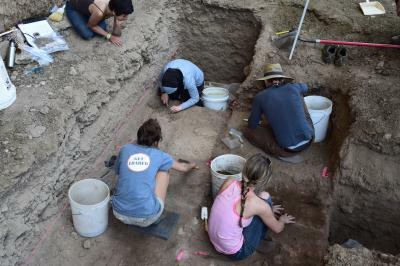 University of Wyoming students excavate a prehistoric rock shelter in the Big Horn Mountains of northern Wyoming during the summer of 2015. Hearths excavated at sites such as this provided many of the radiocarbon dates for new research showing that hunter-gatherers in the region that is now Wyoming and Colorado grew at the same rate as farming societies in Europe. 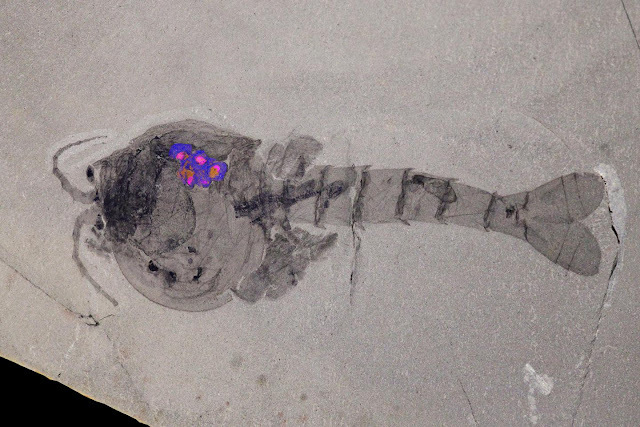 508 million-year-old Waptia found to have eggs containing preserved embryos. Long before kangaroos carried their joeys in their pouches and honey bees nurtured their young in hives, there was the 508-million-year-old Waptia. Little is known about the shrimp-like creature first discovered in the renowned Canadian Burgess Shale fossil deposit a century ago, but recent analysis by scientists from the University of Toronto, Royal Ontario Museum, and Centre national de la recherche scientifique has uncovered eggs with embryos preserved within the body of the animal. It is the oldest example of brood care in the fossil record. "As the oldest direct evidence of a creature caring for its offspring, the discovery adds another piece to our understanding of brood care practices during the Cambrian Explosion, a period of rapid evolutionary development when most major animal groups appear in the fossil record," said Jean-Bernard Caron, curator of invertebrate palaeontology at the Royal Ontario Museum and associate professor in the Departments of Earth Sciences and Ecology & Evolutionary Biology at the University of Toronto. Caron, along with Jean Vannier at the Centre national de la recherche scientifique in Lyon, France, describe the findings in a study published December 17 in Current Biology. Waptia fieldensis is an early arthropod, belonging to a group of animals that includes lobsters and crayfish. It had a two-part structure covering the front segment of its body near the head, known as a bivalved carapace. Caron and Vannier believe the carapace played a fundamental role in how the creature practised brood care. Illustration of Waptia fieldensis (middle Cambrian) shows eggs brooded between the inner surface of the carapace and the body. "Clusters of egg-shaped objects are evident in five of the many specimens we observed, all located on the underside of the carapace and alongside the anterior third of the body," said Caron. The clusters are grouped in a single layer on each side of the body with no or limited overlapping among the eggs. In some specimens, eggs are equidistant from each other, while in others, some are are closer together, probably reflecting variations in the angle of burial and movement during burial. The maximum number of eggs preserved per per individuals probably reached 24. "This creature is expanding our perspective on the diversification of brood care in early arthropods," said Vannier, the co-author of the study. "The relatively large size of the eggs and the small number of them, contrasts with the high number of small eggs found previously in another bivalved arthropod known as Kunmingella douvillei. And though that creature predates Waptia by about seven million years, none of its eggs contained embryos." Kunmingella douvillei also presented a different method of carrying its young, as its eggs were found lower on the body and attached to its appendages. The presence of these two different parental strategies suggests an independent and rapid evolution of a variety of methods of parental care of offspring. Together with previously described brooded eggs in ostracods from the Upper Ordovician period 450 million years ago, the discovery supports the theory that the presence of a bivalved carapace played a key role in the early evolution of brood care in arthropods. The research appears in a study titled "Waptia and the diversification of brood care in early arthropods" published in Current Biology. It was supported by a Natural Sciences and Engineering Research Council of Canada Discovery Grant to Jean-Bernard Caron, an ANR (Agence Nationale de la Recherche) Grant to Jean Vannier, and the University of Lyon. A study published today finds a surprising and very recent shift away from the steady relationship among species that prevailed for more than 300 million years. The study, published in the journal Nature, offers the first long-term view of how species associated with each other for half of the existence of multicellular life on Earth, says co-author Donald Waller, a professor of botany at the University of Wisconsin-Madison. "We did not expect, or predict, that we would see continuity in the fossil record for such a long time. The fraction of plant and animal species that were positively associated with each other was mostly unchanged for 300 million years. Then that fraction sharply declined over the last 6,000 years," says Waller, a plant ecologist. Species are 'positively associated' if they are found in the same place and time. Starting about 6,000 years ago, negatively associated species were preponderant, meaning plants and animals are seldom found in the same place and time, a sign that longstanding relationships have been disturbed. 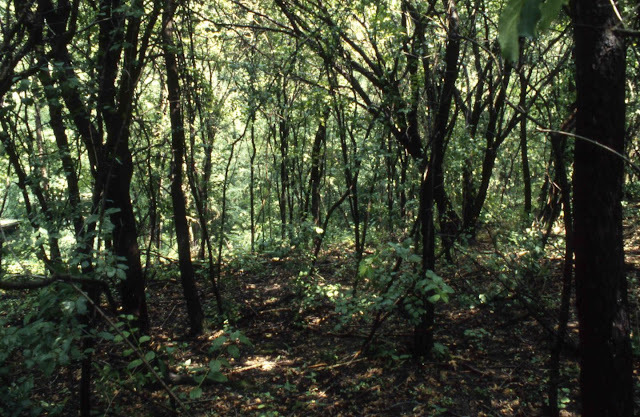 A Southern Wisconsin woods being strangled by buckthorn, a tree that was sold in nurseries and started to invade the region over the past half-century. As buckthorn excludes all other vegetation, this site that was formerly dominated by oak shows some of the ways that human activity has changed the relationship among species, as described by UW-Madison botany professor Donald Waller and co-authors in a new study in the journal Nature. In assessing the cause of the dramatic change they found, the researchers first eliminated five possible sources of error. "Senior author Nicholas Gotelli, of the University of Vermont, developed careful methods to guard against false positive results," Waller says. "With a result as unexpected as this, we wanted to be very careful to make sure that the pattern was real and not an artifact of the methods we were using, or the particular datasets we looked at." The most likely cause for the shift, the researchers state, was rapid human population growth, with ensuing effects from plant and animal agriculture. "The conclusion we reluctantly came to is that there have been systematic changes around the world in ecological conditions, prompting changes in the pattern of species coexistence," Waller says. "This is an aspect of global change that has never been noticed, or documented before." Although the researchers do not have direct evidence for the cause of any particular species assemblage, patterns of species living together form an intricate ecological web involving predation, symbiosis, disease, nutrition, habitat and evolution, Waller points out. The situation on continents, often recognized as having more stable species assemblages, is now starting to resemble the situation on islands, Waller says. "In general, island habitats are fragmented, and species are vulnerable and declining. Islands are models for conservation biology because they indicate what happens in the end game" as species go extinct and biodiversity declines. The study, supported by the National Science Foundation, is more evidence that humans have substantially changed the planet, Waller adds. "The Paris accord on climate signed last week reflects a global recognition that humans have fundamentally changed our planet's climate. Now we present evidence that humans are changing the Earth in another fundamental way: how species are associated with one another. It's fossil evidence that we have entered the 'anthropocene,' a geologic era marked by human dominance of the planet. In fact, the study even provides a way to date the start of the anthropocene." It was a beautiful landing site, said Bradley L. Jolliff, PhD, the Scott Rudolph Professor of Earth and Planetary Sciences at Washington University in St. Louis, who is a participant in an educational collaboration that helped analyze Chang'e-3 mission data. The lander touched down on a smooth flood basalt plain next to a relatively fresh impact crater (now officially named the Zi Wei crater) that had conveniently excavated bedrock from below the regolith for the Yutu rover to study. Four views of the Mare Imbrium basin and the Chang'e-3 landing site demonstrate how different the Moon looks to different types of remote sensing, underscoring the need for ground truth to calibrate the orbital observations. Since the Apollo program ended, American lunar exploration has been conducted mainly from orbit. But orbital sensors primarily detect the regolith (the ground-up surface layer of fragmented rock) that blankets the Moon, and the regolith is typically mixed and difficult to interpret. Because Chang'e-3 landed on a comparatively young lava flow, the regolith layer was thin and not mixed with debris from elsewhere. Thus it closely resembled the composition of the underlying volcanic bedrock. This characteristic made the landing site an ideal location to compare in situ analysis with compositional information detected by orbiting satellites. "We now have 'ground truth' for our remote sensing, a well-characterized sample in a key location," Jolliff said. "We see the same signal from orbit in other places, so we now know that those other places probably have similar basalts." The basalts at the Chang'e-3 landing site also turned out to be unlike any returned by the Apollo and Luna sample return missions. "The diversity tells us that the Moon's upper mantle is much less uniform in composition than Earth's," Jolliff said. "And correlating chemistry with age, we can see how the Moon's volcanism changed over time." Two partnerships were involved in the collection and analysis of this data, published in the journal Nature Communications Dec. 22. Scientists from a number of Chinese institutions involved with the Chang'e-3 mission formed one partnership; the other was a long-standing educational partnership between Shandong University in Weihai, China, and Washington University in St. Louis. The Moon, thought to have been created by the collision of a Mars-sized body with the Earth, began as a molten or partially molten body that separated as it cooled into a crust, mantle and core. But the buildup of heat from the decay of radioactive elements in the interior then remelted parts of the mantle, which began to erupt onto the surface some 500 million years after the Moon's formation, pooling in impact craters and basins to form the maria, most of which are on the side of the Moon facing the Earth. Chang'e-3 landing site is indicated with a white square in this lunar map, a mosaic made with the Lunar Reconnaissance Orbiter's Wide Angle Camera. 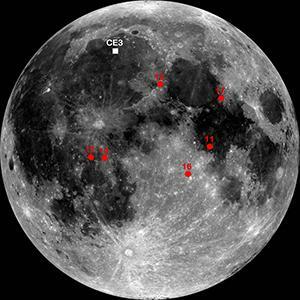 The landing sites of the Apollo missions are in red. The American Apollo (1969-1972) and Russian Luna (1970-1976) missions sampled basalts from the period of peak volcanism that occurred between 3 and 4 billion years ago. But the Imbrium basin, where Chang'e-3 landed, contains some of the younger flows -- 3 billion years old or slightly less. The basalts returned by the Apollo and Luna missions had either a high titanium content or low to very low titanium; intermediate values were missing. 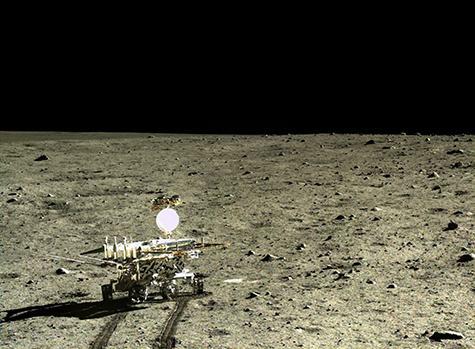 But measurements made by an alpha-particle X-ray spectrometer and a near-infrared hyperspectral imager aboard the Yutu rover indicated that the basalts at the Chang'e-3 landing site are intermediate in titanium, as well as rich in iron, said Zongcheng Ling, PhD, associate professor in the School of Space Science and Physics at Shandong University in Weihai, and first author of the paper. 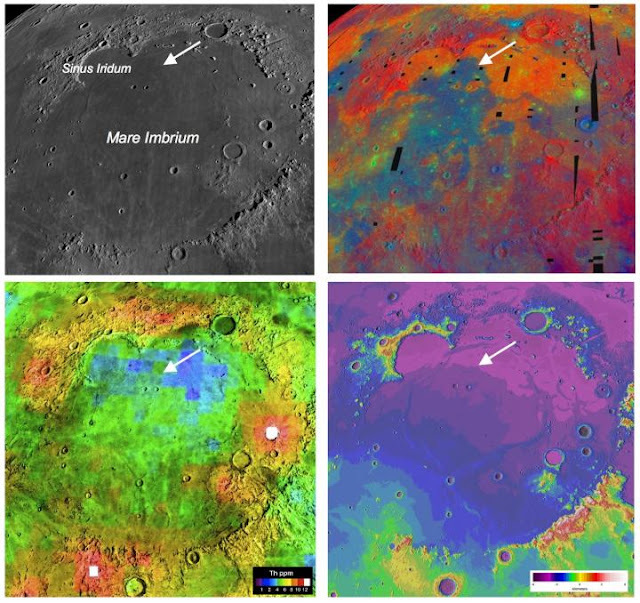 Titanium is especially useful in mapping and understanding volcanism on the Moon because it varies so much in concentration, from less than 1 weight percent TiO2 to over15 percent. This variation reflects significant differences in the mantle source regions that derive from the time when the early magma ocean first solidified. Minerals crystallize from basaltic magma in a certain order, explained Alian Wang, PhD, research professor in earth and planetary sciences in Arts & Sciences at Washington University. Typically, the first to crystallize are two magnesium- and iron-rich minerals (olivine and pyroxene) that are both a little denser than the magma, and sink down through it, then a mineral (plagioclase feldspar), that is less dense and floats to the surface. This process of separation by crystallization led to the formation of the Moon's mantle and crust as the magma ocean cooled. The titanium ended up in a mineral called ilmenite (FeTiO3) that typically doesn't crystallize until a very late stage, when perhaps only 5 percent of the original melt remains. When it finally crystallized, the ilmenite-rich material, which is also dense, sank into the mantle, forming areas of Ti enrichment. "The variable titanium distribution on the lunar surface suggests that the Moon's interior was not homogenized," Jolliff said. "We're still trying to figure out exactly how this happened. Possibly there were big impacts during the magma ocean stage that disrupted the mantle's formation." The story has another twist that also underscores the importance of checking orbital data against ground truth. The remote sensing data for Chang'e-3's landing site showed that it was rich in olivine as well as titanium. The Chinese lunar rover, Yutu, photographed by its lander Chang'e-3, after the lander touched down in Mare Imbrium, a giant impact basin that had been filled by successive lava flows. That doesn't make sense, Wang said, because olivine usually crystallizes early and the titanium-rich ilmenite crystallizes late. Finding a rock that is rich in both is a bit strange. "That makes more sense," Jolliff said, "because iron-enriched olivine and ilmenite are more likely to occur together. "You still have to explain how you get to an olivine-rich and ilmenite-rich rock. One way to do that would be to mix, or hybridize, two different sources," he said. The scientists infer that late in the magma-ocean crystallization, iron-rich pyroxene and ilmenite, which formed late and at the crust-mantle boundary, might have begun to sink. and early-formed magnesium-rich olivine might have begun to rise. As this occurred, the two minerals might have mixed and hybridized. "Given these data, that is our interpretation," Jolliff said. In any case, it is clear that these newly characterized basalts reveal a more diverse Moon than the one that emerged from studies following the Apollo and Luna missions. Remote sensing suggests that there are even younger and even more diverse basalts on the Moon, waiting for future robotic or human explorers to investigate, Jolliff said. A Japanese research team has solved how auroral breakups occur. Hot charged particles, or plasmas, gather in near-Earth space -- just above the upper atmosphere of the polar region -- when magnetic field lines reconnect in space. This makes the plasma rotate, creating a sudden electrical current above the polar regions. Furthermore, an electric current overflows near the bright aurora in the upper atmosphere, making the plasma rotate and discharge the extra electricity. This gives rise to the 'surge,' the very bright sparks of light that characterize substorms. On the left is and aurora oval before the auroral breakup occurs On the right is a supercomputer simulation reveals how auroral breakups develop Hot charged particles, or plasmas, gather in near-Earth space -- just above the upper atmosphere of the polar region -- when magnetic field lines reconnect in space. This makes the plasma rotate, creating a sudden electrical current above the polar regions. Furthermore, an electric current overflows near the bright aurora in the upper atmosphere, making the plasma rotate and discharge the extra electricity. This gives rise to the 'surge', the very bright sparks of light that characterize substorms. Using new images that show unprecedented detail, scientists have found that material rotating around a very young protostar probably has dragged in and twisted magnetic fields from the larger area surrounding the star. The discovery, made with the National Science Foundation's Karl G. Jansky Very Large Array (VLA) radio telescope, has important implications for how dusty disks -- the raw material for planet formation -- grow around young stars. The scientists studied a young protostar about 750 light-years from Earth in the constellation Perseus. Their observations, made in 2013 and 2014, measured the alignment, or polarization, of radio waves emitted by material, mostly dust, falling into a burgeoning disk orbiting the young star. The polarization information revealed the configuration of magnetic fields in this region near the star. Magnetic field lines (purple) are twisted as they are dragged inward toward a swirling, dusty disk surrounding a young star in this artist's conception. "The alignment of magnetic fields in this region near young stars is very important to the development of the disks that orbit them. Depending on its alignment, the magnetic field can either hinder the growth of the disk or help funnel material onto the disk, allowing it to grow," said Leslie Looney, of the University of Illinois at Urbana-Champaign. As material from the envelope of dust and gas surrounding the young star falls inward toward the rotating disk, it is likely to drag magnetic field lines with it. Because of this, the structure of the magnetic field near the star will become different from the field's structure farther away. "Our VLA observations are showing us this region, where the change in shape of the magnetic field is taking place," said Erin Cox, also of the University of Illinois Urbana-Champaign. The observations, she added, produced the first images at wavelengths of 8 and 10 millimeters to show the polarization near a protostar. The observations also indicated that millimeter- to centimeter-sized particles are numerous in the disk surrounding the young star. Since the protostar is only about 10,000 years old -- very short in astronomical timescales -- this may mean that such grains form and grow quickly in the environment of a still-forming star. The star, dubbed NGC1333 IRAS 4A, is one of two young stars forming within a common envelope of dust and gas. The disk around it contains material with a total mass more than twice that of our Sun. Cox and Looney are part of an international team of astronomers studying the protostar. The scientists are reporting their results in the Astrophysical Journal Letters. Astronomers using the Atacama Large Millimeter/submillimeter Array (ALMA) have found the clearest evidence yet that giant planets have recently formed around four young stars. These new worlds, each presumably several times more massive than Jupiter, were inferred by the telltale structures they produced in the disks of gas and dust that surround the stars. This ALMA image combines a view of the dust around the young star DoAr 44 (orange) with a view of the gaseous material (blue). The smaller hole in the inner gas is a telltale sign of the presence of a young planet clearing the disk. The bar at the bottom of the image indicates the diameter of the orbit of Neptune in the Solar System (60 AU). Though planets appear remarkably plentiful in our Galaxy, astronomers still don’t fully understand how and under what conditions they form. To help answer these questions, scientists study the structure and composition of the planet-forming disks of dust and gas around young stars. Astronomers using the Atacama Large Millimeter/submillimeter Array (ALMA) have found telltale differences between the gaps in the gas and the dust in disks around four young stars. These new observations are the clearest indications yet that planets with masses several times that of Jupiter have recently formed in these disks. Certain disks, called transitional disks, have a surprising absence of dust at their centers, in the region around the star. Two main ideas have been put forward to explain these mysterious cavities. First, the strong stellar winds and intense radiation from the star could have blown away or simply destroyed the encircling gas and dust. Alternatively, massive young planets in the process of formation could have cleared the material as they orbit the star. Previous observations lacked the sensitivity and resolution to determine the most likely explanation. With ALMA, however, the team of astronomers, led by Nienke van der Marel of Leiden Observatory, the Netherlands, was able to map the distribution of gas and dust in four of these transitional disks better than ever before. Astronomers using the Atacama Large Millimeter/submillimeter Array (ALMA) have found telltale differences between the gaps in the gas and the dust in disks around four young stars. These new observations are the clearest indications yet that planets with masses several times that of Jupiter have recently formed in these disks. This schematic diagram shows how the dust (brown) and gas (blue) is distributed around the star, and how a young planet is clearing the central gap. The new ALMA images confirm that the dust-free zones of these disks are not empty, but instead contain significant amounts of gas. These gas-filled regions, the researchers discovered, also contain cavities that are up to three times smaller than the gaps observed in the dust. Such structures are best explained by the scenario in which newly formed massive planets have cleared the gas as they traveled around their orbits. Remarkably, these observations were conducted utilizing just one tenth of the current resolving power of ALMA, as they were performed while half of the array was still under construction on Chajnantor Plateau in northern Chile. This ALMA image combines a view of the dust around the young star HD 135344B (orange) with a view of the gaseous material (blue). The smaller hole in the inner gas is a telltale sign of the presence of a young planet clearing the disk. The bar at the bottom of the image indicates the diameter of the orbit of Neptune in the Solar System (60 AU). Further studies are now needed to determine whether more transitional disks also point toward this planet-clearing scenario, though ALMA’s observations have, in the meantime, provided astronomers with a valuable new insight into the complex process of planetary formation. The formal names of the specific stars studied by ALMA are: SR 21, HD 135344B (SAO206462), DoAr 44, and Oph IRS 48. Conserving the genetic resources of potato and sweetpotato has been a major priority of CIP since its founding in 1971. CIP maintains the largest collections of potato (more than 4,000 varieties) and sweetpotato (more than 8,000 varieties) in the world. The genebank holds over 80% of the world's native potato and sweetpotato cultivars and over 80% of the known species of wild potato. 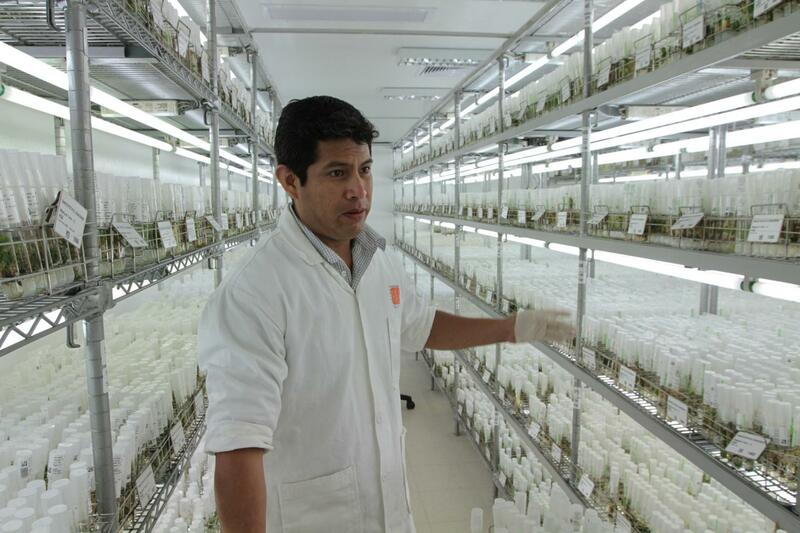 It also maintains more than 1,500 accessions of native Andean root and tuber crops (ARTCs). CIP conserves and preserves the genetic diversity of these valuable crops so that future generations can benefit from the amazing benefits of these treasured crops -- much of which is yet to be discovered. By maintaining these collections, CIP conserves this diversity in perpetuity so new discoveries can be made. The potato's center of diversity is in the Andean region. It was domesticated roughly 3800 years ago along the shores of Lake Titicaca in Peru. 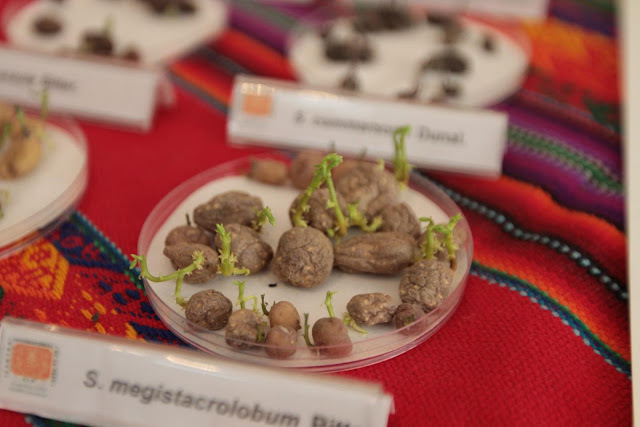 Farmers today use the traditional knowledge of their ancestors to grow this Andean treasure. Still the potato has its vulnerabilities, climate change being one of the most severe challenges. 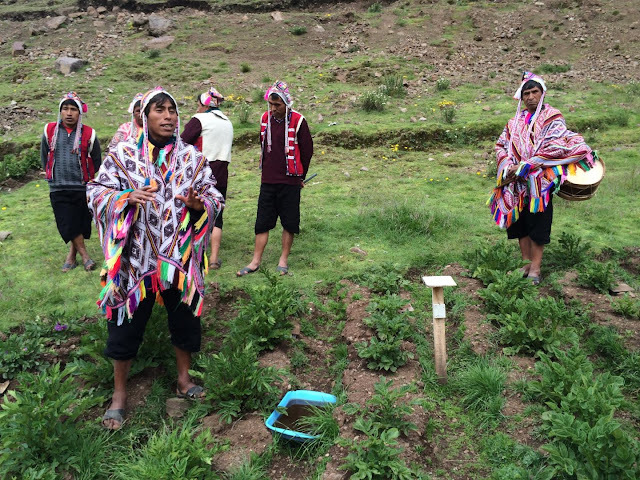 In Potato Park in Pisac, Peru near Cusco, farmers use ancient methods and modern research to learn more about how climate change will affect potato as the Earth's temperature increases. These Quechua-speaking farmers demonstrate one of several test plots planted one hundred meters apart ascending up the slope of a mountain. They monitor temperature, rainfall, and pests and diseases to see which potato varieties perform best under the conditions at each level of altitude. In general Potato requires a period of cold weather to perform best. Slowly that critical temperature required is moving up the hillside, requiring farmers to cultivate fields at higher and higher elevations as pests and diseases thrive in the warmer conditions at elevations in which they had not previously existed. It took 100 million years for oxygen levels in the oceans and atmosphere to increase to the level that allowed the explosion of animal life on Earth about 600 million years ago, according to a UCL-led study funded by the Natural Environment Research Council. Before now it was not known how quickly Earth’s oceans and atmosphere became oxygenated and if animal life expanded before or after oxygen levels rose. The new study, published today in Nature Communications, shows the increase began significantly earlier than previously thought and occurred in fits and starts spread over a vast period. It is therefore likely that early animal evolution was kick-started by increased amounts of oxygen, rather than a change in animal behaviour leading to oxygenation. Researchers from UCL, Birkbeck, Bristol University, University of Washington, University of Leeds, Utah State University and University of Southern Denmark tracked what was happening with oxygen levels globally 770 – 520 million years ago (Ma) using new tracers in rocks across the US, Canada and China. Samples of rocks that were laid down under the sea at different times were taken from different locations to piece together the global picture of the oxygen levels of Earth’s oceans and atmosphere. By measuring selenium isotopes in the rocks, the team revealed that it took 100 million years for the amount of oxygen in the atmosphere to climb from less than 1% to over 10% of today's current level. This was arguably the most significant oxygenation event in Earth history because it ushered in an age of animal life that continues to this day. Dr Pogge von Strandmann, said: "We took a new approach by using selenium isotope tracers to analyse marine shales which gave us more information about the gradual changes in oxygen levels than is possible using the more conventional techniques used previously. We were surprised to see how long it took Earth to produce oxygen and our findings dispel theories that it was a quick process caused by a change in animal behaviour." During the period studied, three big glaciations –the ‘snowball Earth’ Sturtian (~716Ma), and Marinoan (~635Ma) glaciations and the smaller Gaskiers glaciation (~580Ma) - occurred whereby the Earth's land was covered in ice and most of the oceans were frozen from the poles to the tropics. During these periods, temperatures plummeted and rose again, causing glacial melting and an influx of nutrients into the ocean, which researchers think caused oxygen levels to rise deep in the oceans. Increased nutrients means more ocean plankton, which will bury organic carbon in seafloor sediments when they die. Burying carbon results in oxygen increasing, dramatically changing conditions on Earth. Until now, oxygenation was thought to have occurred after the relatively small Gaskiers glaciation melted. The findings from this study pushes it much earlier, to the Marinoan glaciation, after which animals began to flourish in the improved conditions, leading to the first big expansion of animal life. The diversity of mammals on Earth exploded straight after the dinosaur extinction event, according to University College London (UCL) researchers. New analysis of the fossil record shows that placental mammals, the group that today includes nearly 5000 species including humans, became more varied in anatomy during the Paleocene epoch - the 10 million years immediately following the event. Senior author, Dr Anjali Goswami (UCL Genetics, Evolution & Environment), said: "When dinosaurs went extinct, a lot of competitors and predators of mammals disappeared, meaning that a great deal of the pressure limiting what mammals could do ecologically was removed. They clearly took advantage of that opportunity, as we can see by their rapid increases in body size and ecological diversity. Mammals evolved a greater variety of forms in the first few million years after the dinosaurs went extinct than in the previous 160 million years of mammal evolution under the rule of dinosaurs." First author of both papers, Dr Thomas Halliday (UCL Earth Sciences and Genetics, Evolution & Environment), said: "The mass extinction that wiped out the dinosaurs 66 million years ago is traditionally acknowledged as the start of the 'Age of Mammals' because several types of mammal appear for the first time immediately afterwards. "Many recent studies suggest that little changed in mammal evolution during the Paleocene but these analyses don't include fossils from that time. When we look at the mammals that were present, we find a burst of evolution into new forms, followed by specialisation that finally resulted in the groups of mammals we see today. The earliest placental mammal fossils appear only a few hundred thousand years after the mass extinction, suggesting the event played a key role in diversification of the mammal group to which we belong." The team studied the bones and teeth of 904 placental fossils to measure the anatomical differences between species. This information was used to build an updated tree of life containing 177 species within Eutheria (the group of mammals including all species more closely related to us than to kangaroos) including 94 from the Paleocene - making it the tree with the largest representation from Paleocene mammals to date. The new tree was analysed in time sections from 140 million years ago to present day, revealing the change in the variety of species. Dr Anjali Goswami (UCL Genetics, Evolution & Environment), added: "Extinctions are obviously terrible for the groups that go extinct, non-avian dinosaurs in this case, but they can create great opportunities for the species that survive, such as placental mammals, and the descendants of dinosaurs: birds." Professor Paul Upchurch (UCL Earth Sciences), co-author of the Biological Reviews study, added: "Several previous methodological studies have shown that it is important to include as many species in an evolutionary tree as possible: this generally improves the accuracy of the tree. By producing such a large data set, we hope that our evolutionary tree for Paleocene mammals is more robust and reliable than any of the previous ones. Moreover, such large trees are very useful for future studies of large-scale evolutionary patterns, such as how early placental mammals dispersed across the continents via land bridges that no longer exist today." 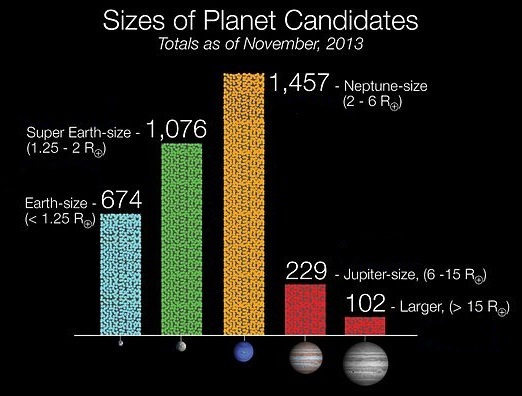 What Kind of Stars Make Rocky Planets Like Earth?